PT Pertamina (Persero) - Pertamina is the national energy company of Indonesia. It is completely owned by the government of Indonesia with the Ministry of State-Owned Enterprise (SOE) as the Shareholder Proxy. Based in Jakarta, PT Pertamina (Persero) running business in the field of integrated oil and natural gas industry, from upstream to downstream activities. 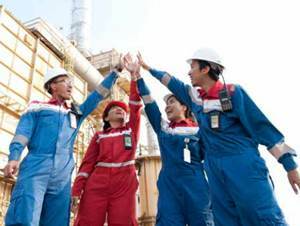 Its business include oil and natural gas, renewable and new energy resources.As of December 2016, Pertamina runs its business through 6 refinery units and 8 Marketing operation regions spread in all over Indonesia. Pertamina conducted business operations in all parts of Indonesia under the management of 27 wholly owned subsidiary companies, 7 associated companies, and 6 joint venture companies. In 2016, the performance of PT Pertamina (Persero) is showing good results. According to PT Pertamina (Persero) Annual Report 2016 as cited by JobsCDC.com, Pertamina registered total crude oil production of 311.56 MBOPD in 2016. This total crude oil production reflected an 11.9% increase from 278.37 MBOPD in 2015. Pertamina booked a net profit of US$3.15 billion in 2016 or 121.6% increase from US$1.42 billion in 2015. Total assets in 2016 grew by 4% to US$47.23 billion from US$45.52 billion in 2015. Maximum age of 22 years old on 1 August 2017 (Birth after 31 July 2017). Have SMA/SMK diploma or temporary diploma/SKL for graduated in 2017. SMA majoring in IPA. SMK majoring in Industrial Chemistry, Mechanical, Civil, Electrical, and Instrumentation. SMA : minimum 6.5 for Mathematics, Physics, Chemistry, and English. SMK : minimum 6.5 for Mathematics, English and 3 main subject according to expertise. Willing to be placed in all working area of Pertamina. Drug-free statement letter (stamped Rp 6,000). JobsCDC.com now available on android device. Download now on Google Play here. Please be aware of recruitment fraud. The entire stage of this selection process is free of charge. 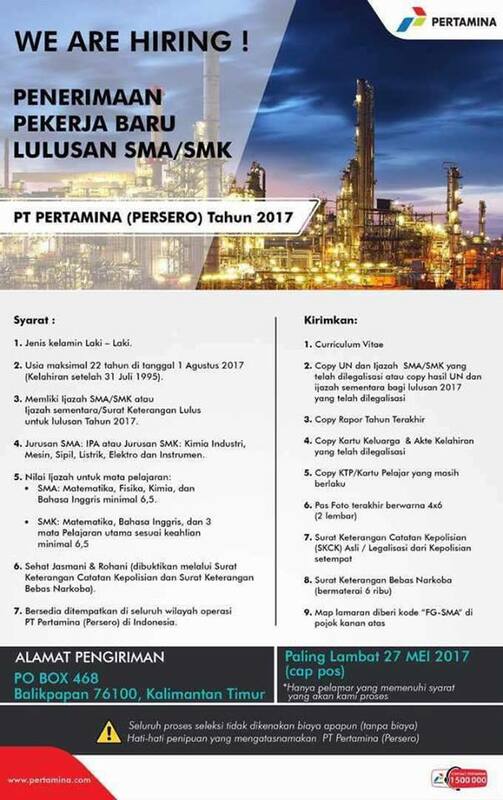 PT Pertamina (Persero) - Recruitment Fresh Graduate SMA, SMK Pertamina May 2017 will never ask for fees or upfront payments for any purposes during the recruitment process such as transportation and accommodation.